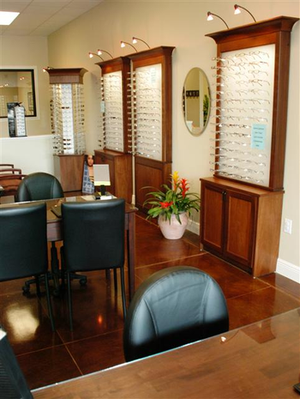 The mission of Amazing Eyes is to earn the loyalty of our customers by providing comprehensive eye exams and exceptional service in our optical boutique. To achieve this, we try to exceed the expectations of our customers. Storm Floyd states, "I brought Dr. Martha J. Wright in to our business because I wanted an optometrist that would provide patients with excellent eye exams with a personal touch. I know she will help achieve our mission!" At Amazing Eyes we take pride in our attention to detail and our patients appreciate the meticulous craftsmanship in all of Storm's work. Correct frame styling and optical measurements are imperative for good vision and comfort. The eyewear you choose, whether prescription or non-prescription, must satisfy your individual lifestyle and visual needs. We offer an extensive selection of prescription and non-prescription sunglasses, as well as specialty sports frames for golfing, boating, cycling, fishing, and skiing. Amazing Eyes emphasizes the family with a large child's selection, multi-pair savings, and senior citizen discounts. All prescriptions are welcome, most major insurances are accepted. Amazing Eyes is a participating member of the South Baldwin Chamber of Commerce, Better Business Bureau, Alabama Society of Dispensing Opticians (ASDO) and the Mississippi Association of Dispensing Opticians (MADO). We support local schools, Lions Clubs, Community Hospice, Covenant Hospice, local police departments, local fire departments, Chamber of Commerce, The Lighthouse, Blood Drives, BARC events, Optometry Giving Sight, Orbis International, CARE House, American Cancer Society, American Heart Association, Habitat for Humanity, Rotary Clubs and many more!